If you have lost teeth, dental implants in Melbourne are preferable by far when compared to unwieldy dentures. For people who suffer from the indignity of enduring uncomfortable dentures that slip off at inopportune moments frequently in everyday life, dental implants are a boon from heaven itself. 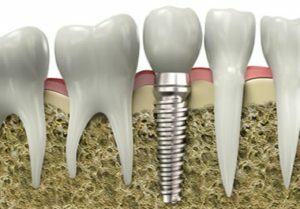 In essence, a dental implant is a metal post (generally titanium), that enables us to mount replacement teeth into that particular area. They provide a strong and durable foundation for your fixed or removable replacement teeth, making the dental implant cost in Melbourne a good investment. 1- Improved appearance: Dental implants do not alter the structure of your mouth, thus reducing discomfort. As compared to dentures, which need reducing of adjacent teeth, this is a very lucrative option. 2- Better speech: Poor orientation of dentures might cause anyone to slur their speech or mumble, creating a very poor impression. Since dental implants mirror the natural orientation of your teeth, such problems are drastically reduced. 3-Great comfort: Since they become a seamless part of your body, dental implants increase orthodontic comfort. 4- Effortless eating: Because you do not have to worry about sliding dentures, eating becomes a treat instead of a chore. 5- Durability: Dental implants are highly durable. With proper care, they can even last a lifetime. 1- Possession of healthy gums: Your gums need to be in fine shape for a successful surgery, as the new implant fuses with the basal jawbone. People with periodontal disease have a high rate of implant failure. 2- Adequate bone support: Since dental implants mesh with the jawbone in order to anchor the replacement tooth properly, adequate bone density and quality is the most important requirement for the success of dental implants. Bone grafts or mini implants may sometimes be considered for patients who do not have enough bone support. 3- Commitment to oral health: For regular maintenance of dental implants, excellent oral hygiene is absolutely necessary. A regime of daily brushing and flossing, along with frequent visits to the dentist is crucial. Keep in mind that these habits are essential in taking care of your natural teeth as well. 4- No teeth clenching: Teeth clenching has shown to negatively affect dental implants. 5- Good overall health: As this is a surgical procedure, the overall physical condition of the patient should be fit enough to enable undergoing the surgery. The best and most sure-fire way to determine your eligibility for a dental implant in Melbourne is to consult a qualified implant dentist. Mostly, he/she will give a look at the above criteria, as well as the location of your missing teeth when making sure that implant dentistry is the best solution for brightening your smile.